For a smooth, delicious filtered cigar smoke, Sparrow Filtered Cigars are some of the best on the market today. Sparrow's have a superb smoke and pull or draw. They are the size of a cigarette, and are convenient to use in areas that permit only cigarette smoking, which do not allow pipe or cigar smoking. 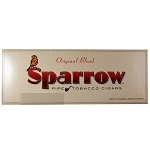 Sparrow is an original blend large cigar that has a natural filter, which significantly adds to its great taste. Although Sparrow Filtered Cigars don't come in fruity flavors like some other brands do, they have a nice, full flavor that is undeniably rich. The smoke strength of a Sparrow Cigar is not heavy like that of a Swisher Sweet, it instead smokes has a mild to medium range strength that is smooth on the taste buds. Sparrow Filtered Cigars don't come in a variety of flavors, however, they do come in an exquisite variety of tasty blends such as Blue Pipe, Original, and Blend #23. Sparrows distinctive taste is derived from the quality of the tobacco that it contains, as well as from the masterful skill utilized by the blender. Gentle aging of the tobacco used, and the talent of the roller, make for a successful binder, wrapper, filler combination. The technique in which Sparrows are rolled is the reason that a Sparrow's smoke burns more smooth and even. Its dimensions are 3" x 18" - 3 inches, and is considered to be classed as a short cigar with an 18 gauge. Sparrow's originated in the United States, are hand made, and infused with ribbon cut pipe tobacco. 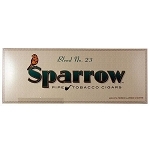 Sparrow Filtered Cigars come in a soft pack that contains 20 cigars, and when sold by the carton, which contains a quantity of 200 cigars inside. 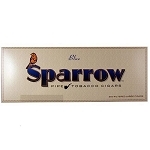 Blue Sparrows are said to be more mellow than Original blend Sparrows, and no matter which blend you choose, Sparrow Filtered Cigars are cost efficient and accomodate almost any budget.